Here’s some pretty cool news, American Airlines has just launched their official AAdvantage Facebook page and their official Twitter channel. Welcome to the official Facebook page for the AAdvantage program! Are you crazy about AAdvantage miles? Well, here is a brand new community for people like you who want to learn about and share all of the great ways to earn those precious miles and some of the fun things you can do using them. We’ve got some BIG plans for our members who “Like” AAdvantage here on Facebook, including promotions, offers, giveaways and more! I’m excited about “promotions, offers, giveaways”! 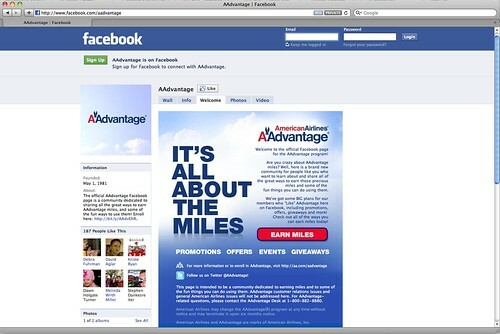 When you visit their new Facebook page, check out the cool video they posted: “Are People Crazy for AAdvantage Miles“. See what happens when they installed a snack vending machine in uptown Dallas that included 500 AAdvantage Miles with each purchase. (I. Would. Drive. To. HOUSTON. For. That!) Go here to watch it. Stay connected with your friends at 30,000 feet! Just open your browser in-flight during the month of February and click the Ford Explorer banner on the Wi-Fi welcome page. You will enjoy full access to Facebook, without purchasing a Wi-Fi pass, compliments of Ford Motor Company. It’s easy and it’s free! You’ll also find a link to their new Twitter channel. I applaud American for using Twitter as another way to communicate with customers and to resolve customer service issues, but I’m hoping for lots of cool, AAdvantage specific news with their new AAdvantage feed and not just a bunch of customer service complaints like the American Airlines Twitter channel. I know that they can’t really control the conversation, but I hope that they’re able to encourage people to limit the conversation to AAdvantage related topics. Anyway, go here to follow and welcome them to Twitter.